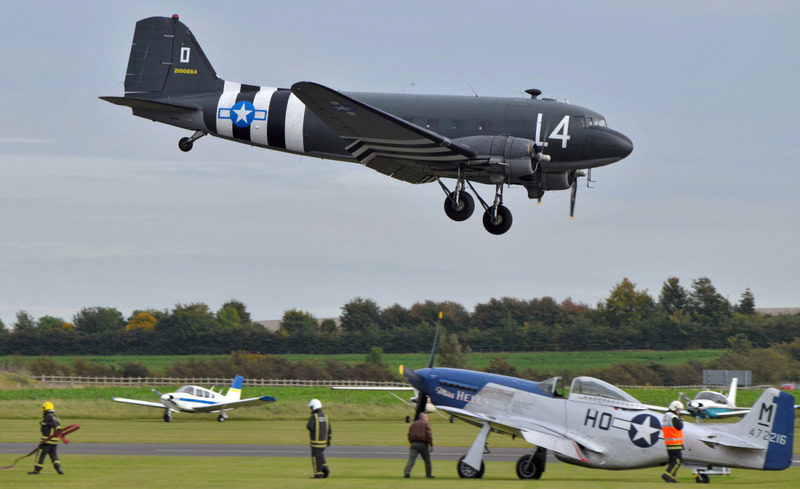 The 'Duxford Battle of Britain Air Show' took place on Saturday 23rd and Sunday 24th September 2017. 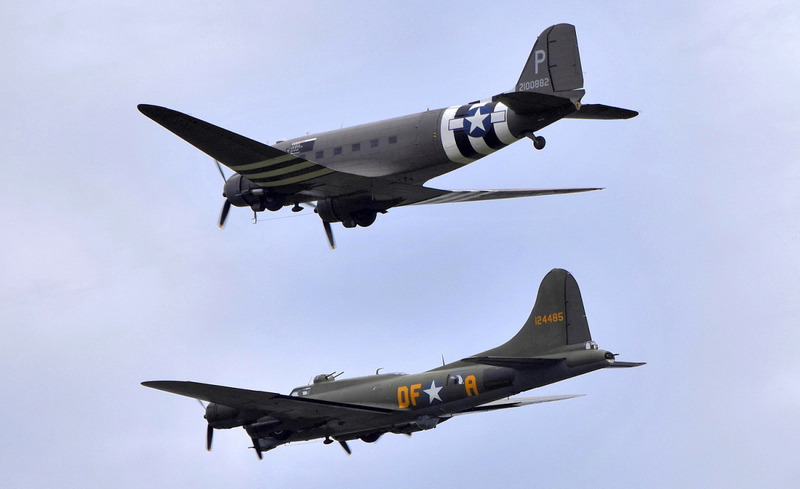 Duxford was an important Second World War fighter station which helped defend Great Britain from aerial attack during the 'Battle of Britain' in 1940. 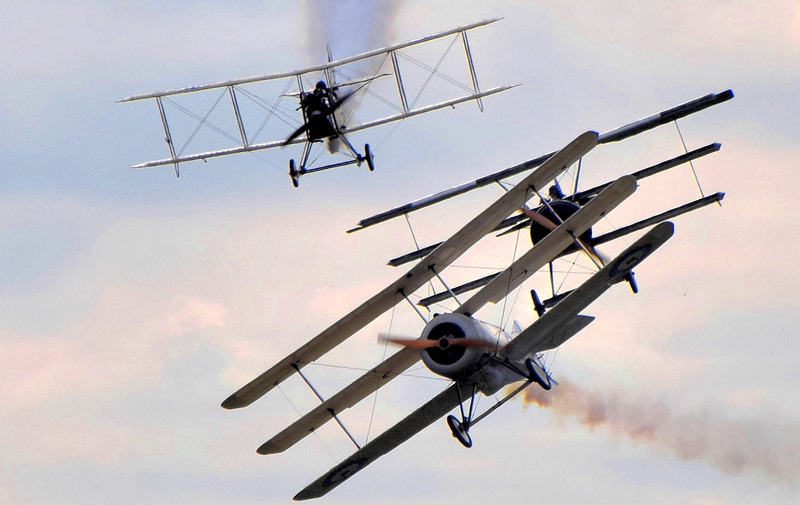 This year also marks the centenary of the Imperial War Museum (IWM) which was established while the First World War was still being fought, and 100 years since work began to create RAF Duxford in 1917. 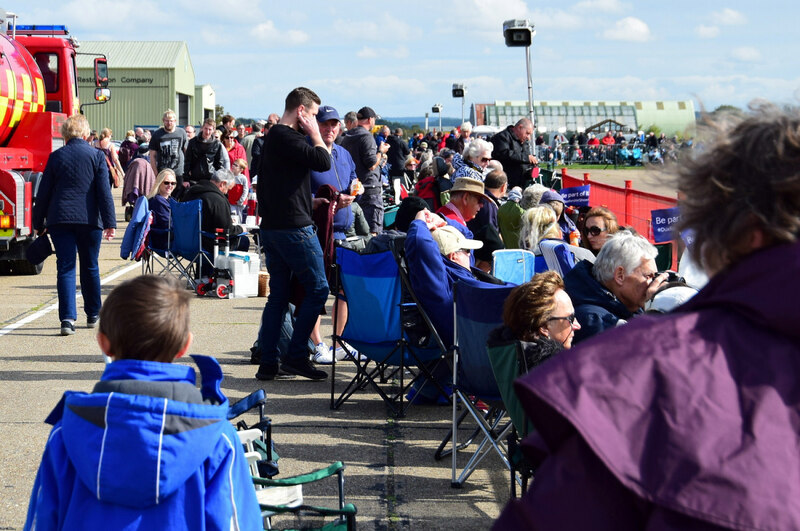 This ticket-only event includes free access to the extensive Imperial War Museum which is well worth exploring before the air display starts at 1pm. 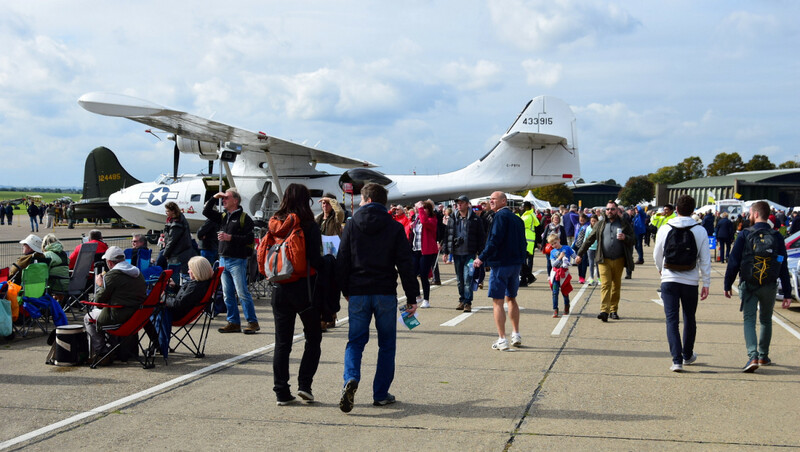 People arriving by car were charged £5 for a vehicle parking permit and a flightline walk was available for an extra £6 for people wishing to get closer to the aircraft on the ground and photograph them. As well as the museum there were plenty more engaging activities on the ground including a 'Home Front Village' with nostalgic Second World War music and authentic living history groups, 'Jitterbug Jive' teaching visitors to cut a rug with classic 1940s swing dancing, watch the 'Bluebird Belles' perform wartime hits, and the 'Home Front Bus' which is a unique living history experience contained within a classic double decker bus. There were also plenty of stalls selling merchandise as well as refreshments. 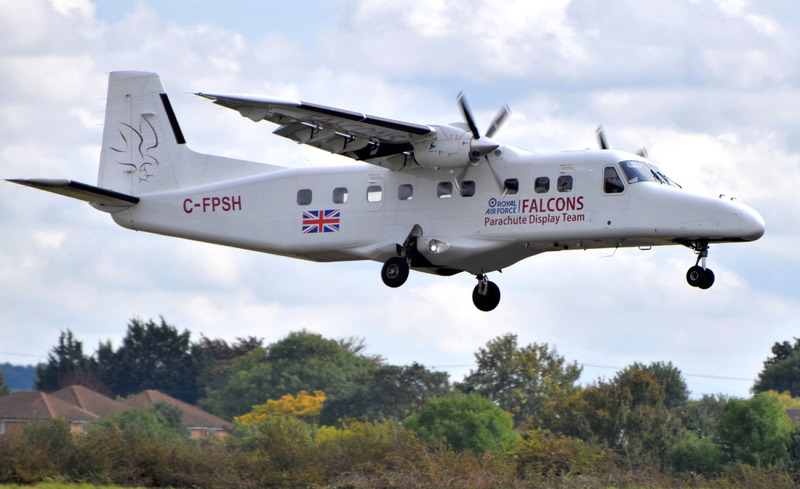 The RAF Falcons Parachute Display Team opened the air display at 1pm, when they jumped from a Dornier 228 (C-FPSH). 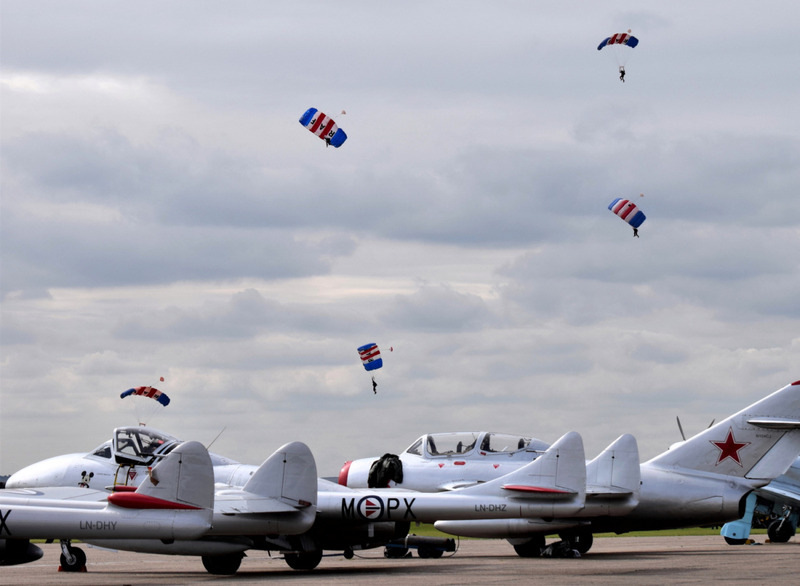 The RAF Falcons are based at RAF Brize Norton in Oxfordshire, as part of the No.1 Parachute Training School. 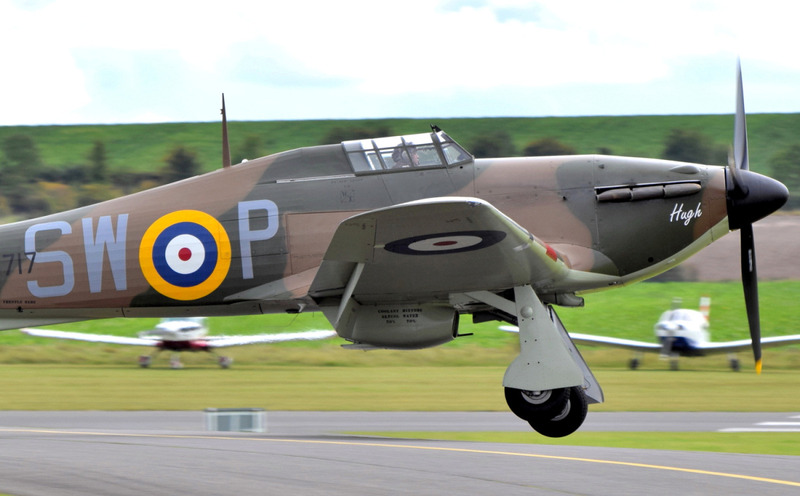 We then saw a formation of no fewer than six Hawker Hurricanes which included the Shuttleworth Collection's Sea Hurricane Mk.Ib (Z7015). 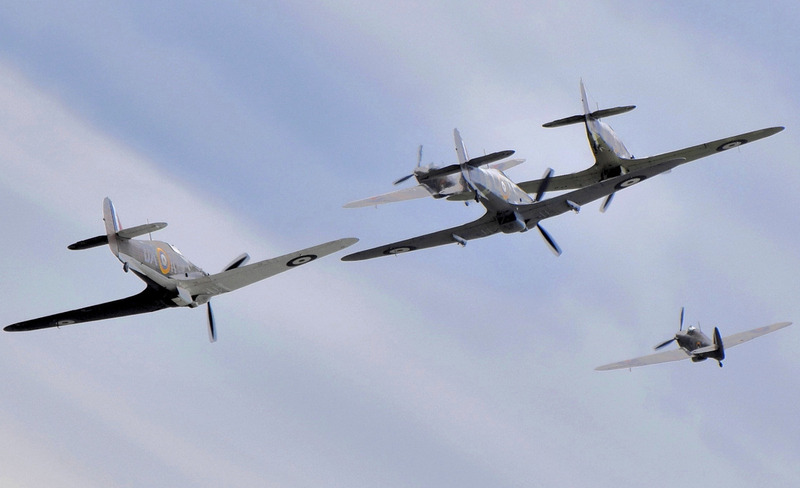 The other Hurricanes were Hurricane Mk.I (P2902, Air Leasing), Hurricane Mk.I (P3717, Hurricane Heritage), Hurricane Mk.IIb (BE505, Hangar 11), Hurricane Mk.X (AE977, Biggin Hill Heritage Hangar) and Hurricane Mk.XII (Z5140, Historic Aircraft Collection). 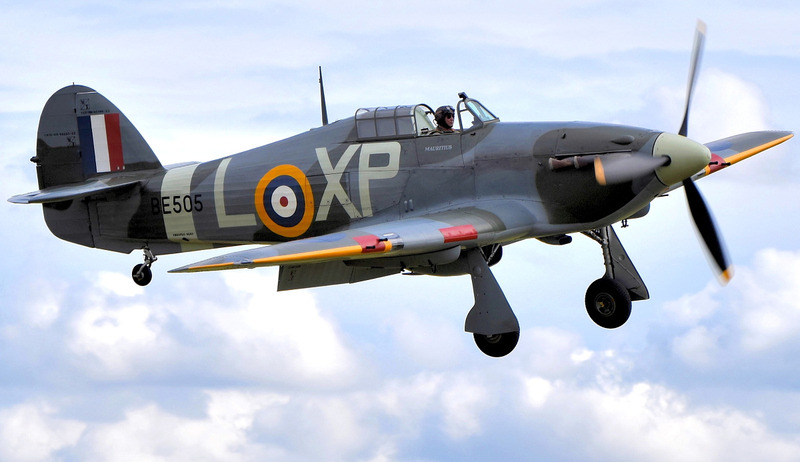 The Hawker Hurricane was overshadowed by the Spitfire during the 'Battle of Britain', but the majority of RAF fighter squadrons were equipped with the Hurricane (32 squadrons), compared to the Spitfire (19 Squadrons), and the Hurricane accounted for about 60 percent of all the RAF air victories in the battle. 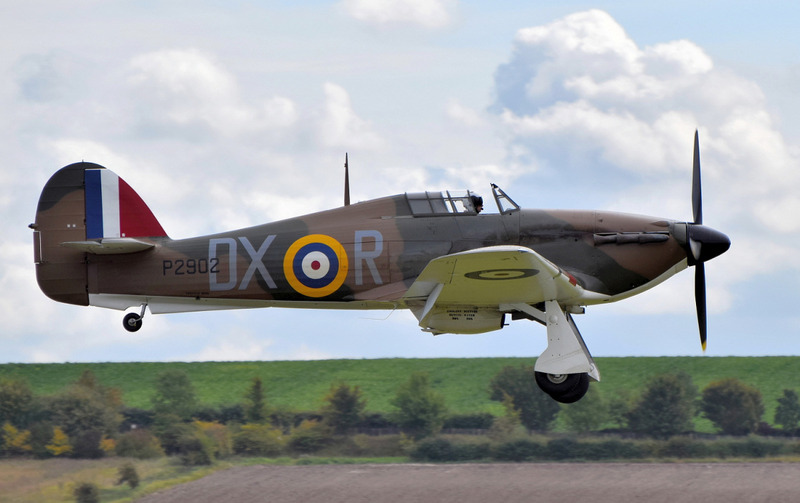 The Spitfire would generally take on the Luftwaffe fighters, while the Hurricane would concentrate on the German bombers. 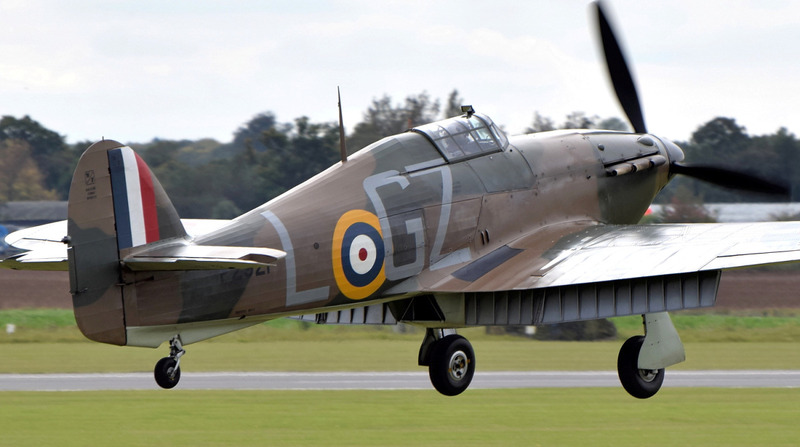 The Hurricane was also easier and cheaper to manufacture than the Spitfire and could withstand more battle damage. 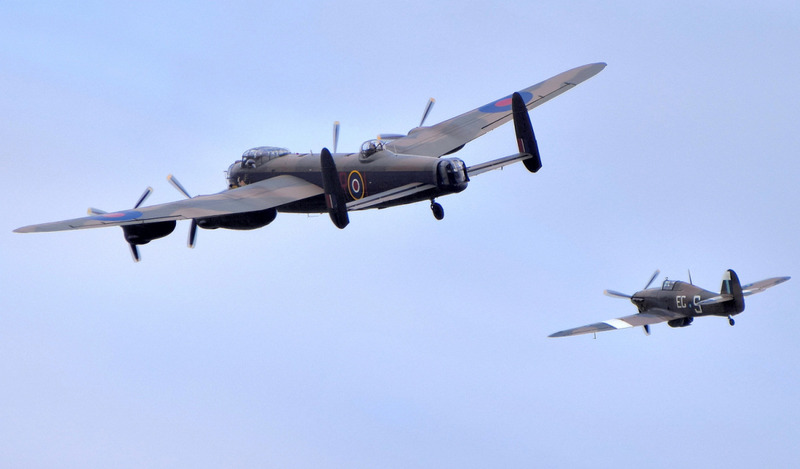 Next up was the Battle of Britain Memorial Flight (BBMF) which consisted of the Avro Lancaster B1 (PA474), a Hawker Hurricane Mk.IIc (PZ865) and Supermarine Spitfire Mk.XVIe (TE311). 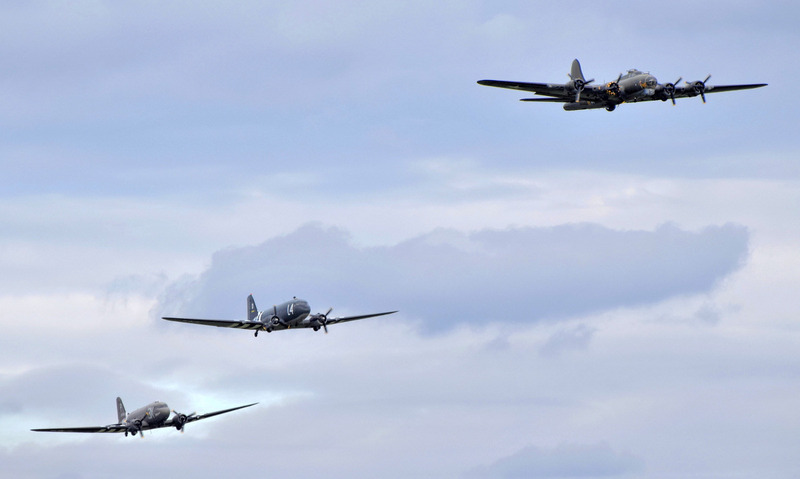 The BBMF consist of twelve aircraft:- 6 Spitfires, 2 Hurricanes, Lancaster, Dakota, and 2 Chipmunks. 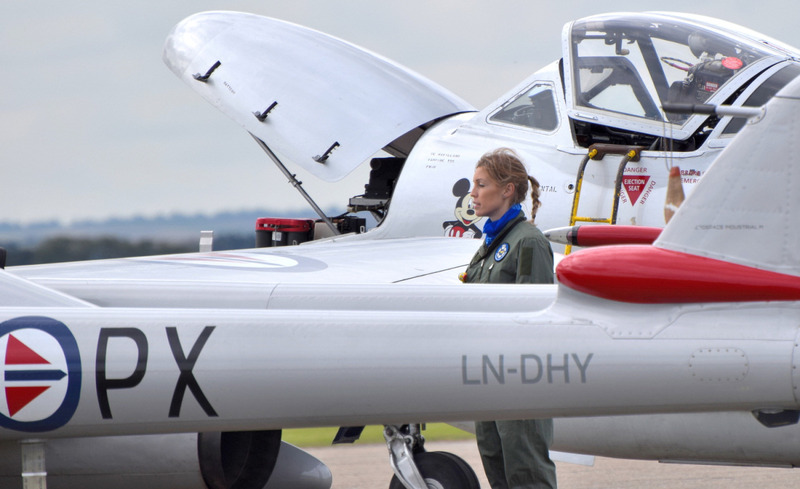 They are operated by the Royal Air Force and have been based at RAF Coningsby in Lincolnshire since 1976. 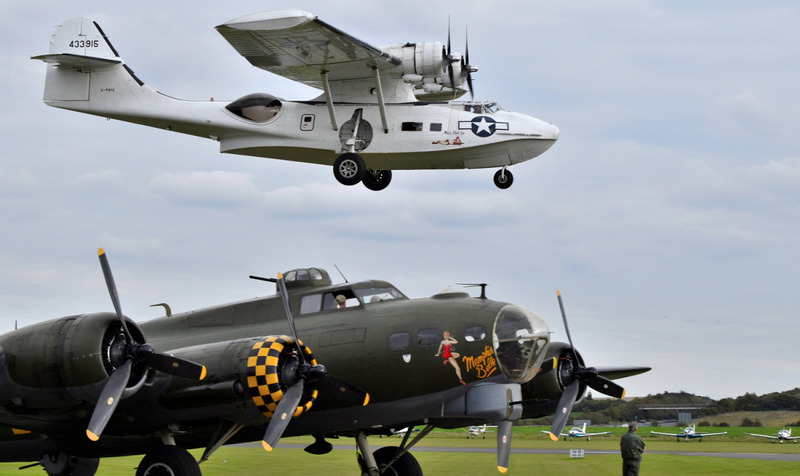 They participate in scores of air displays and events every year. 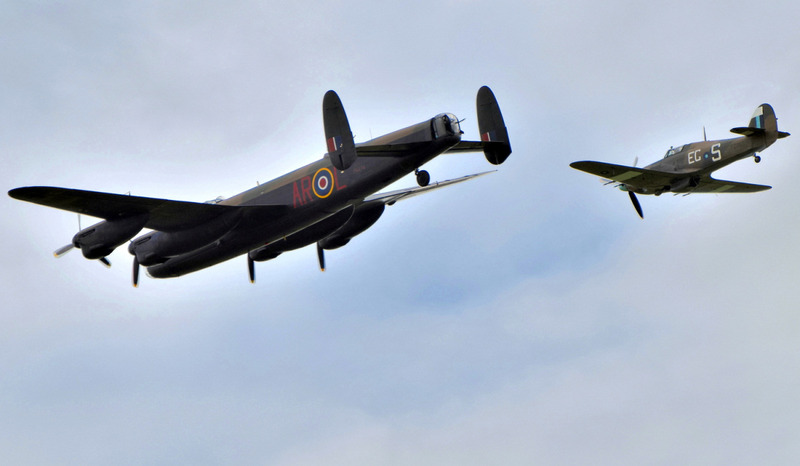 Their Lancaster is one of only two flying in the World today, with the other Lancaster operated by the Canadian Warplane Heritage Museum, based in Hamilton, Ontario, Canada. 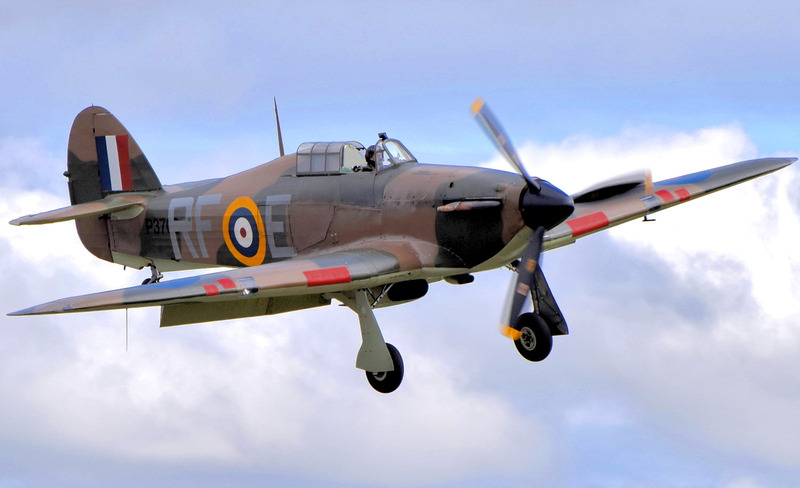 This particular BBMF Hurricane (PZ865) represents Hurricane Mk.IIc (HW840, EG-S) of 34 Squadron, South East Asia Command during 1944, the personal aircraft of Canadian pilot, Flt. Lt. Jimmy Whalen DFC. 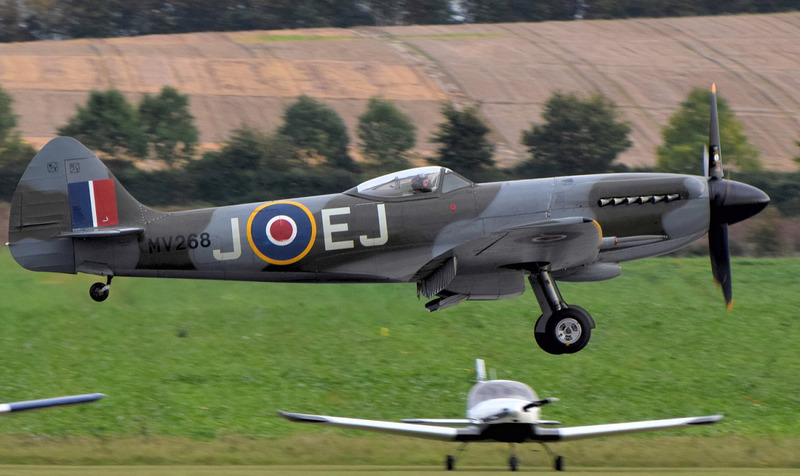 The BBMF Spitfire's (TE311) colour scheme represents Spitfire Mk XVIe (TB675, 4D-V) of No 74 Squadron and was the personal aircraft of Squadron Leader AJ 'Tony' Reeves DFC from the end of December 1944. The Spitfire's clipped wings were to improve low-altitude performance and enhance the roll rate. 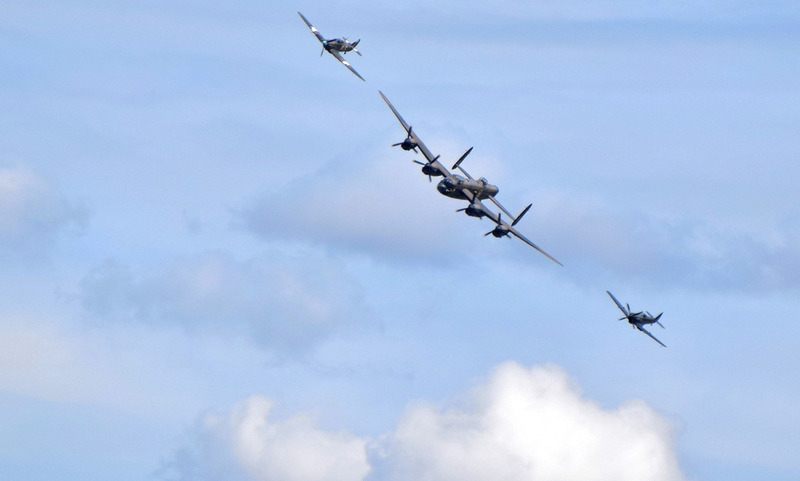 Flight Lieutenant Antony Parkinson, known as Parky, will leave the BBMF this Autumn for pastures new. He joined the RAF at 18 and was privileged to be the first pilot to gain 1000 hours flying the RAF Euro Fighter Typhoon. 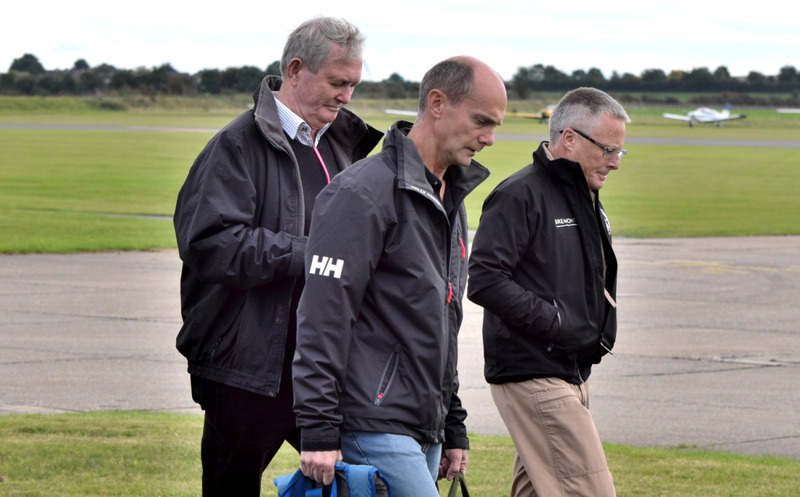 He has also flown over 1000 hours on 3 other types - Phantom F4, Tornado F3 and Hawk, with the Red Arrows. 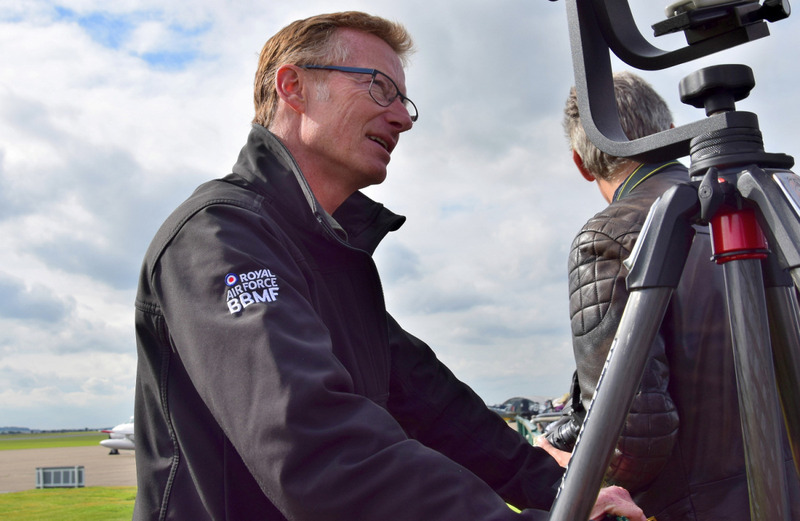 Parky also flew the F16 for 3 years with the Royal Netherlands Air Force and has over 7000 flying hours in total. Married to Ann, most spare time is taken up with 4 children; Edward, James, George and Lucy ranging from 20 to 6 years old. This is his 11th and final year with the Flight, firstly as a volunteer fighter pilot and latterly as the Operations Officer. 'Curtiss Fighters' was represented by The Fighter Collection's (TFC) Curtiss-Wright P-40C Warhawk (41-13357). 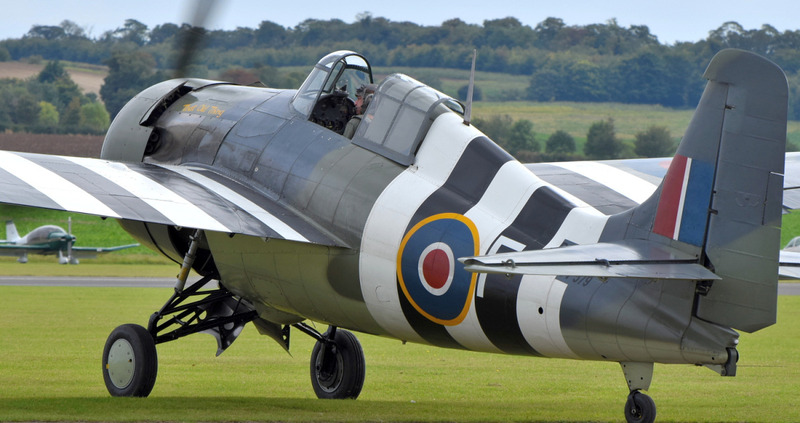 The Fighter Collection was also going to display the Curtiss Hawk 75 but it went unserviceable and did not display. 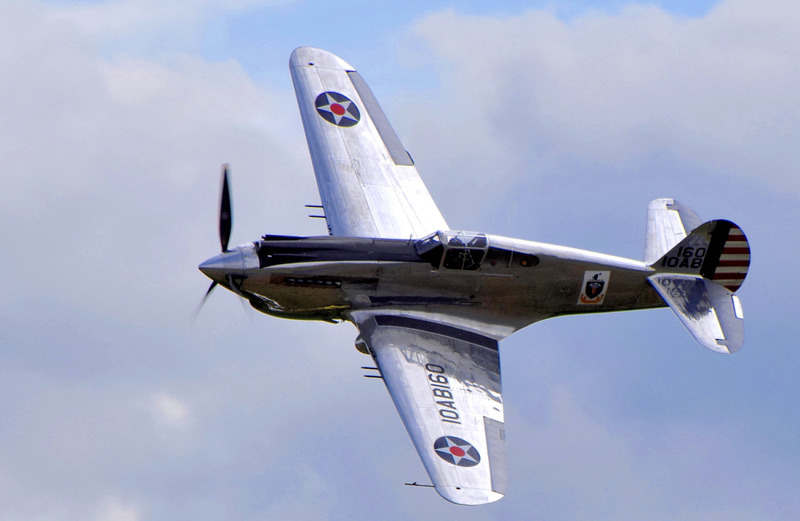 This P-40C Warhawk served with the USAAC in 1941, at Patterson Field, Ohio, before being shipped to Puerto Rico, where it was used for coastal and anti-submarine patrols. 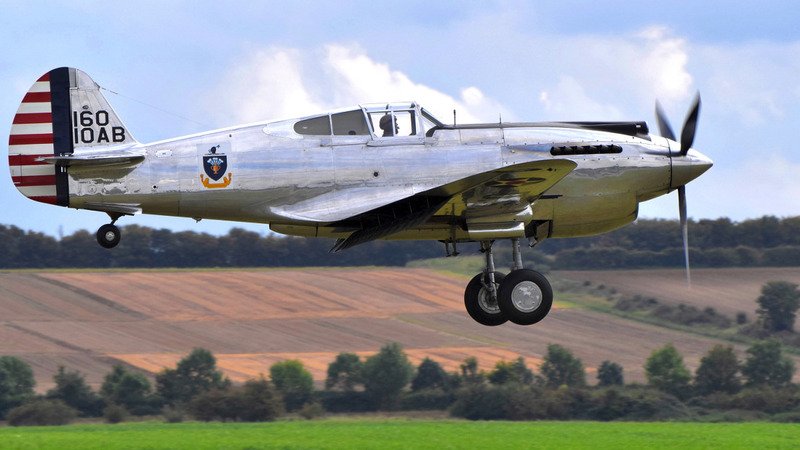 In December 1941 it was shipped out to the USSR, as part of the Lend-Lease programme, but its history there is not well known. 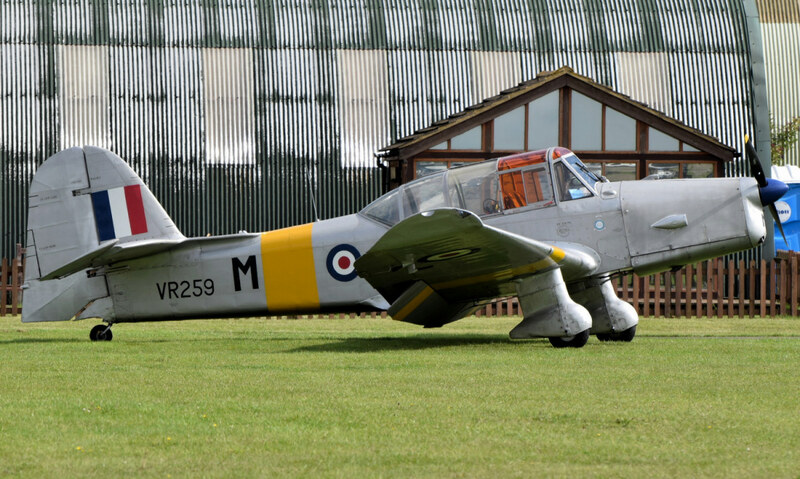 In the 1990s, this aircraft was acquired by 'The Fighter Collection' and restored by the 5th August 2011, when it's first restoration flight took place, flown by Steve Hinton. 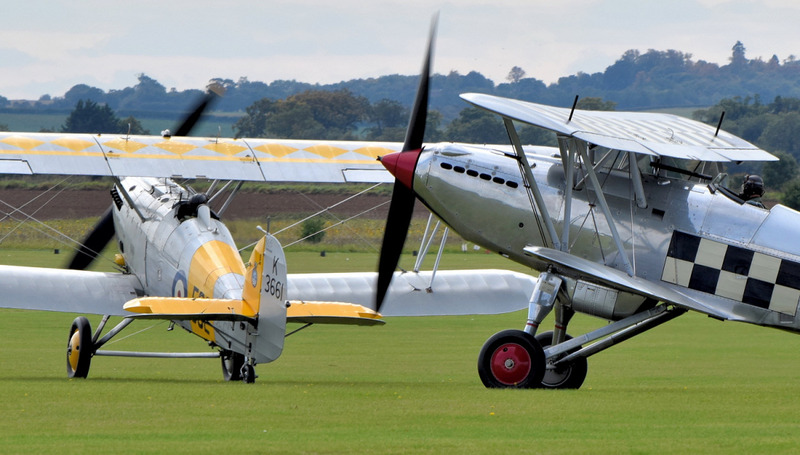 Next, we had a 'Hawker Formation' of the Historic Aircraft Collection's (HAC) Hawker Fury Mk.I (K5674) and Hawker Nimrod Mk.I (K3661). 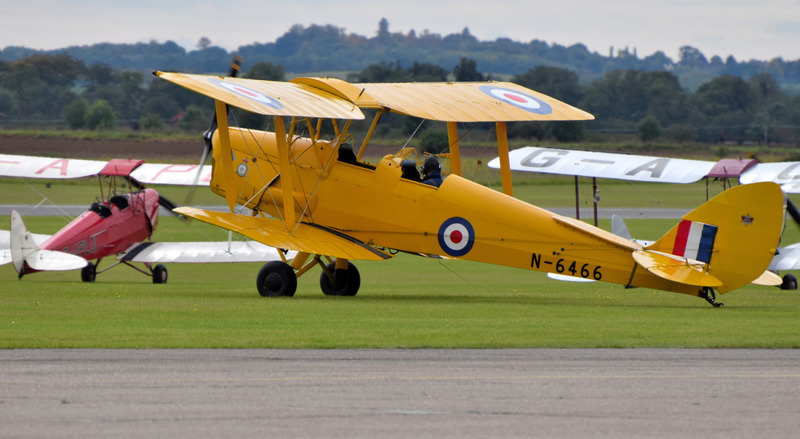 This unique Hawker Fury Mk.I (K5674) was flown by Flying Officer FE Rosier, from the end of 1936 to 1939, and he named the aircraft 'Queen of North and South'. He flew the aircraft on 394 separate occasions and also displayed her at the Empire Air Display at Hendon in both 1937 and 1938. 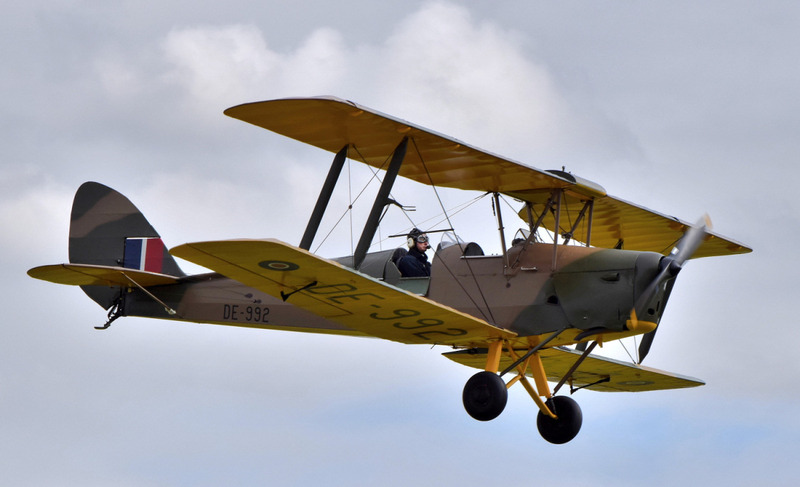 This aircraft went to South Africa in 1940 and was flown by Second Lieutenant Peter M. Hedley, when on 31st March 1941, it ran out of fuel and made a forced landing, and although the pilot was uninjured, the aircraft suffered damage and was stored before being scrapped. 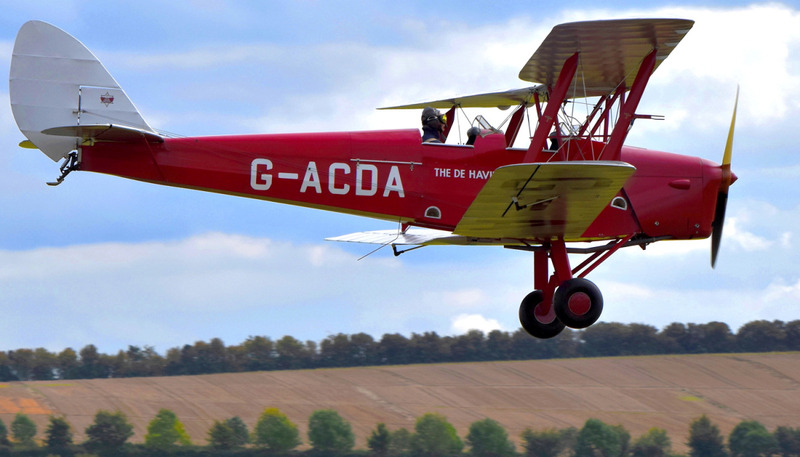 It was restored from 1992 and made her first post restoration flight from Goodwood on the 30th July 2012. In 1972, this Hawker Nimrod Mk.I (K3661) was discovered on a scrap dump at Ashford in Kent in a complete but corroded condition. 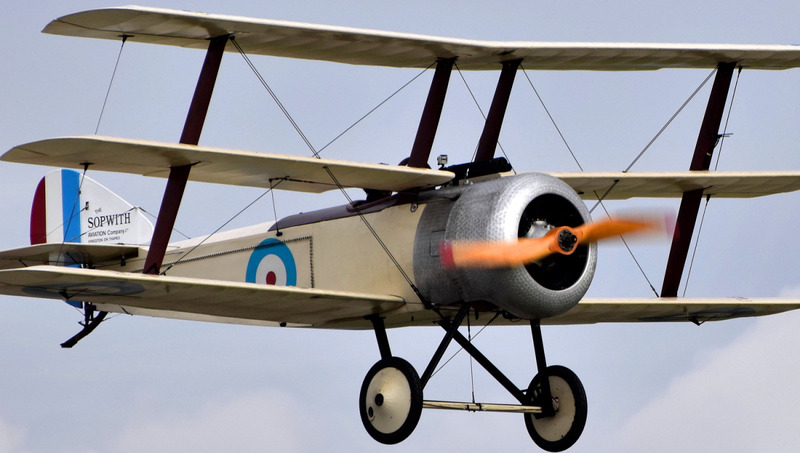 The remains of the aircraft were donated to the RAF Museum and later the fuselage was sold. 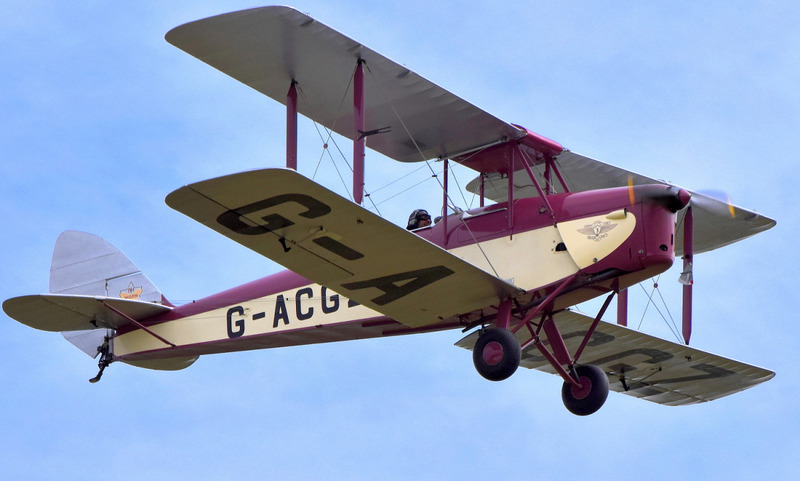 The restoration of this aircraft began in 1992 and a Kestrel engine was found in Canada. 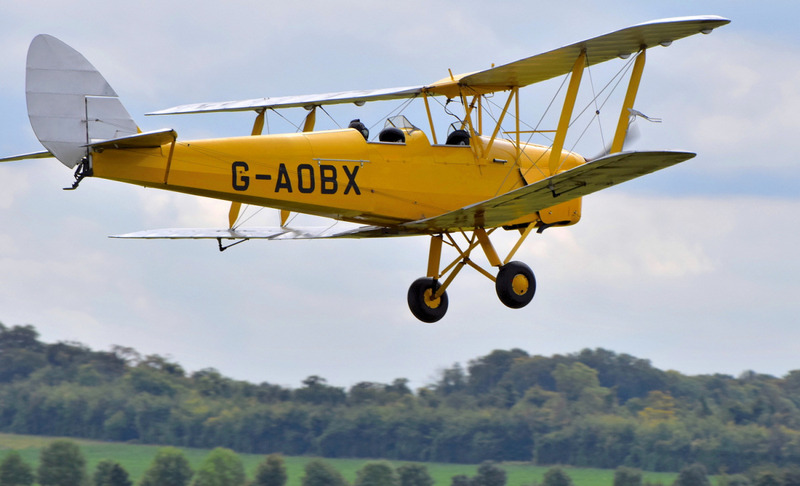 The Nimrod made its post restoration flight on 16th November 2006 at Duxford. 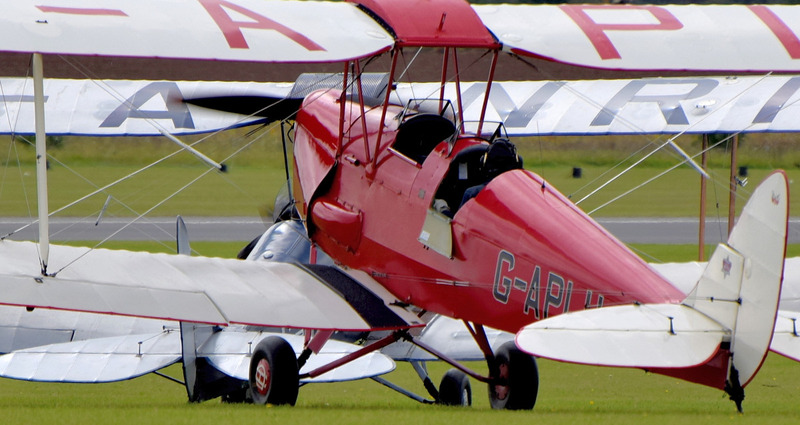 The Tiger 9 Aeronautical Display Team performed their display with nine de Havilland Tiger Moth aircraft. 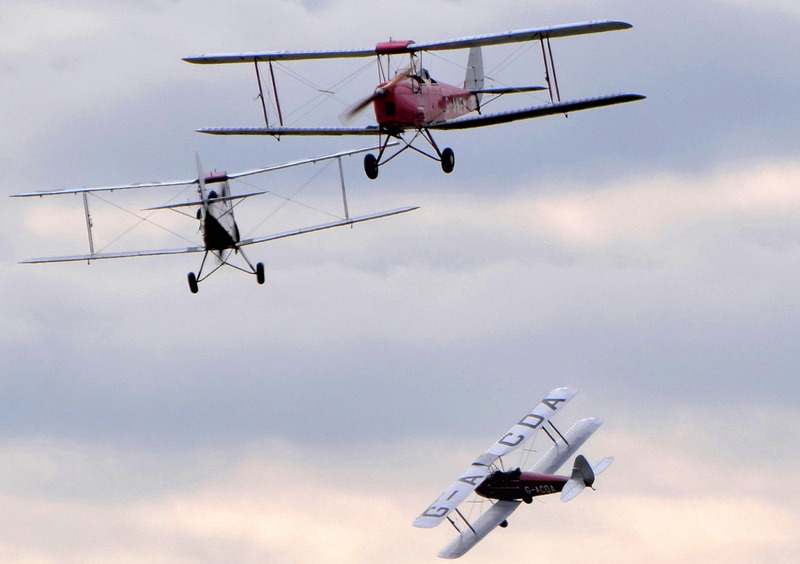 This unique team was formed in 2005 after a request for a flypast of nine Tiger Moths at the 25th de Havilland Moth Club rally at Woburn Abbey. 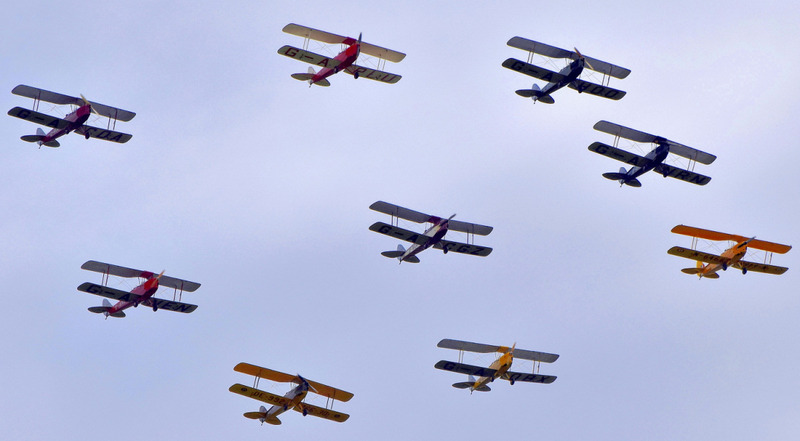 Flying in such a large formation using the low-powered and sluggish Tiger Moth aircraft requires a great deal of skill and discipline from the pilots. 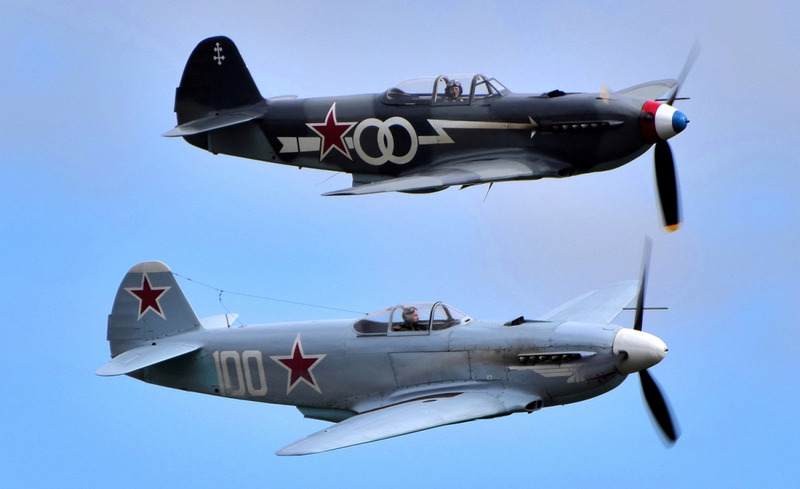 The 'Russian Front' theme included a Hispano HA-1112 Buchon (G-AWHK, Aircraft Restoration Company), a Yakovlev Yak-3M (Air Leasing), and a Yakovlev Yak-3UA (Will Greenwood). 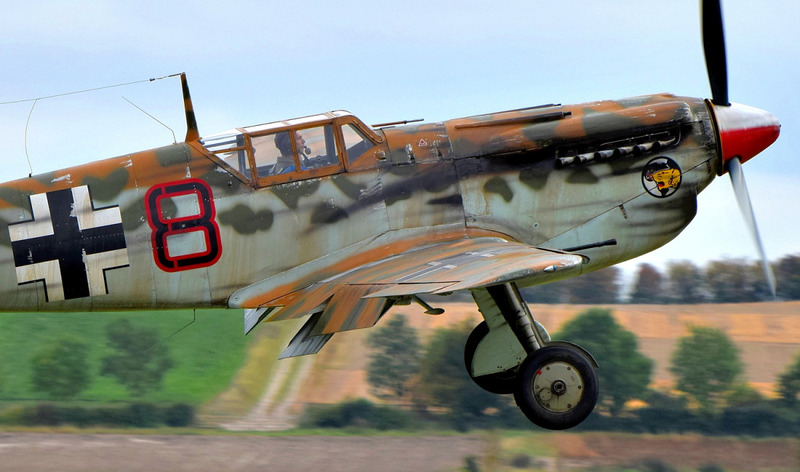 The Buchon was a license-built version of the Messerschmitt Bf 109G, developed in Spain during and after World War II and is powered by the Merlin engine rather than a Daimler-Benz engine. 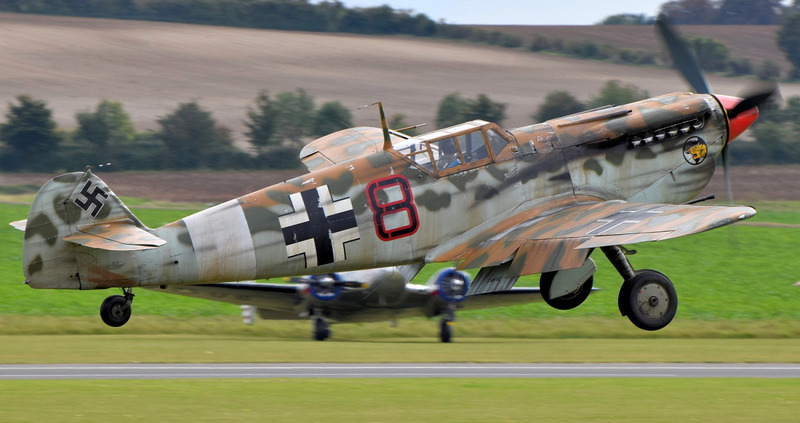 This aircraft appeared in the film 'Valkyrie' starring Tom Cruise and presently wears a heavily weathered desert paint scheme to represent Messerschmitt Bf109 E-7 "Black 8" of JG27, flown by Leutnant Werner Schroer. 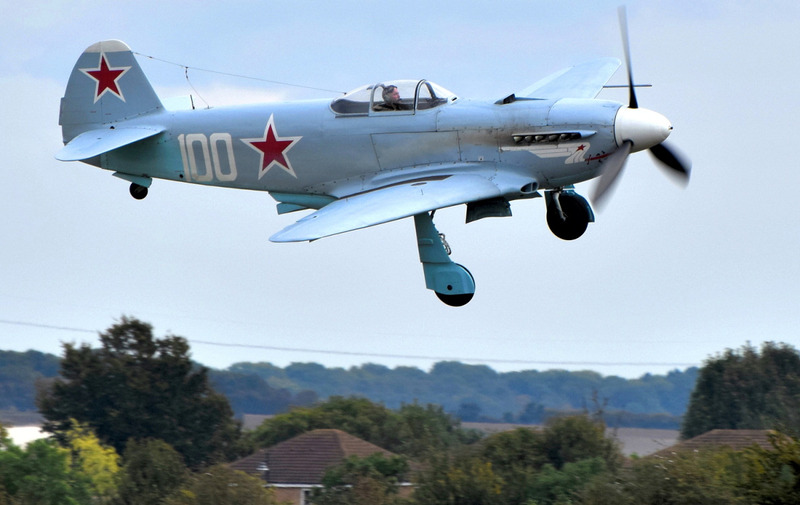 The Yakovlev Yak-3 was a World War II Soviet fighter aircraft which had an excellent performance due to its high power-to-weight ratio. 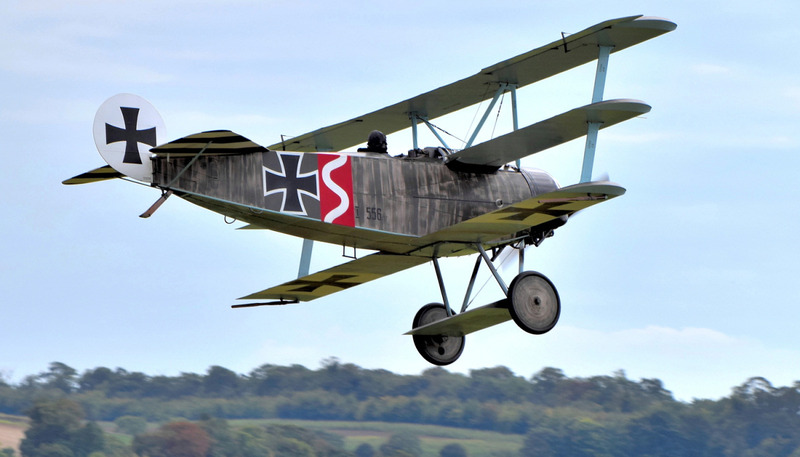 The excellent Great War Display Team brought along their Junkers CLI, Fokker DR.Is, RAF BE2c, RAF SE5a and Sopwith Triplane replica aircraft, which were accompanied by flak, bombing and strafing pyrotechnics, during the display. 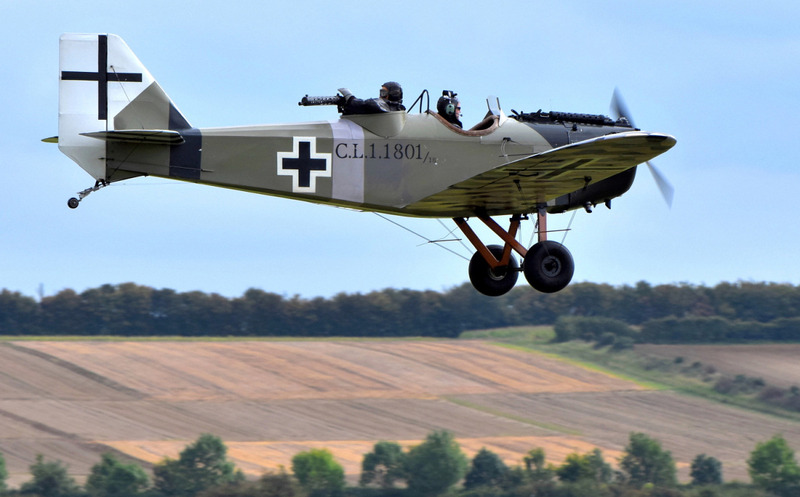 This team was formed in 1988 with a collection of World War One replica aircraft including five RAF SE5as, two Fokker Dr.Is and a Fokker D.VII, and called themselves 'The Wombats'. This year is not only the centenary of the end of the Great War but also the 30th anniversary of the Team's formation. 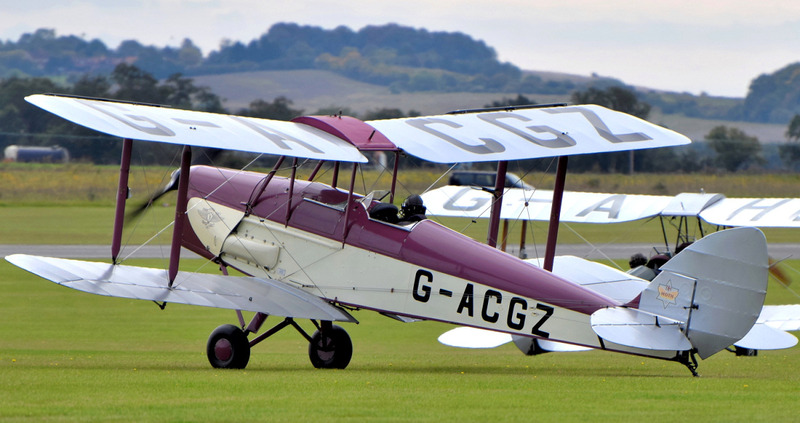 The 'Bristol Formation' display consisted of the Bristol Blenheim Mk.IF (Aircraft Restoration Company), as well as Shuttleworth's Gloster Gladiator Mk.I (L8032) and a Westland Lysander Mk.III. 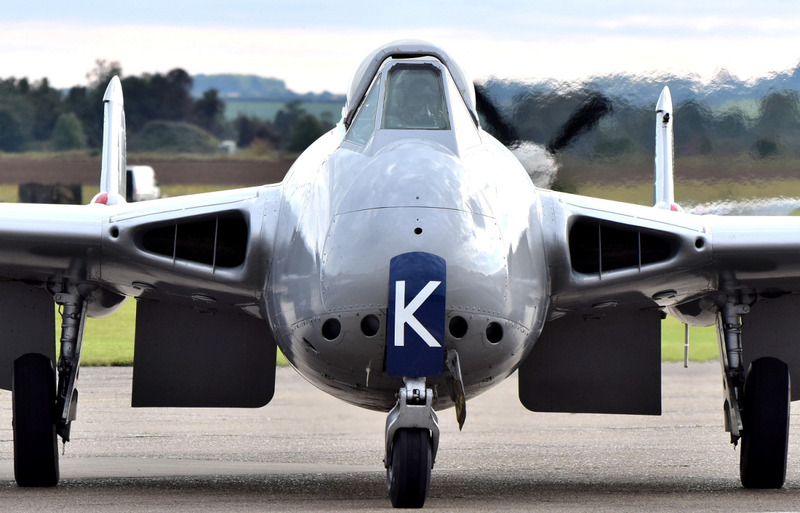 The nose of this Blenheim is from an aircraft that served as a night fighter in the 'Battle of Britain'. After the war, it was acquired by Ralph Nelson, an innovative electrician, who converted it into an electric car using the chassis of an Austin 7, which he drove for ten years until it suffered a fire. Ralph heard of the ongoing second Blenheim restoration at Duxford and donated the car to the project in 1992. After a huge amount of work, the nose was then fitted to this Blenheim and even has the car's tax disc in the front window, which has been left as a lasting legacy of Ralph and his electric car. 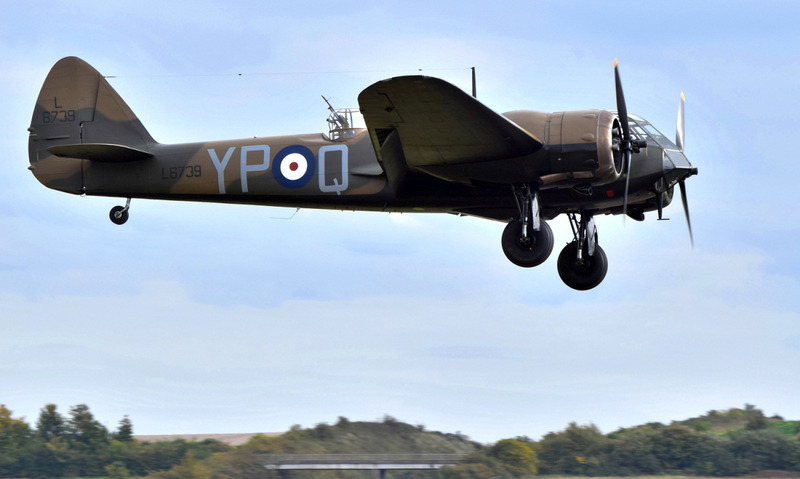 To find out more about this impressive aircraft and help keep her flying then please visit the Blenheim Society website. 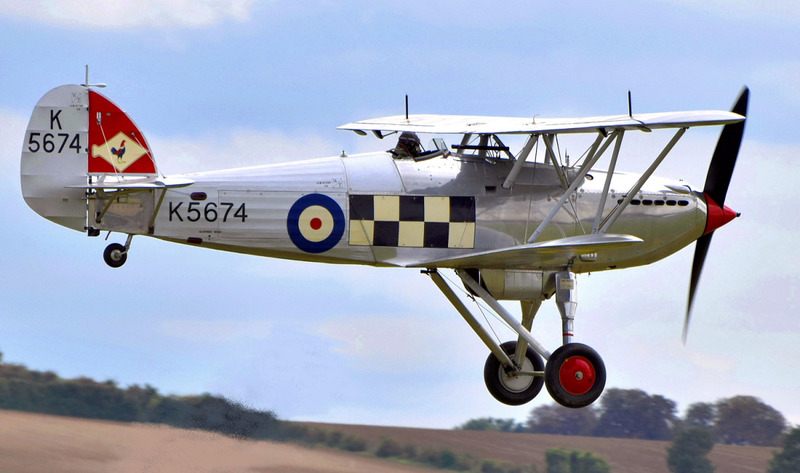 Shuttleworth's Gladiator was the last production Gladiator I, built in 1937. 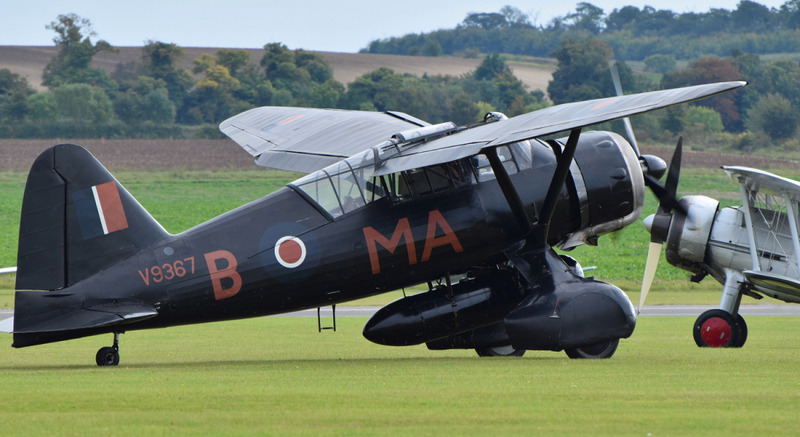 When 'Gloster Aircraft' closed, this Gladiator was presented to The Shuttleworth Collection for safe keeping on 7 November 1960. 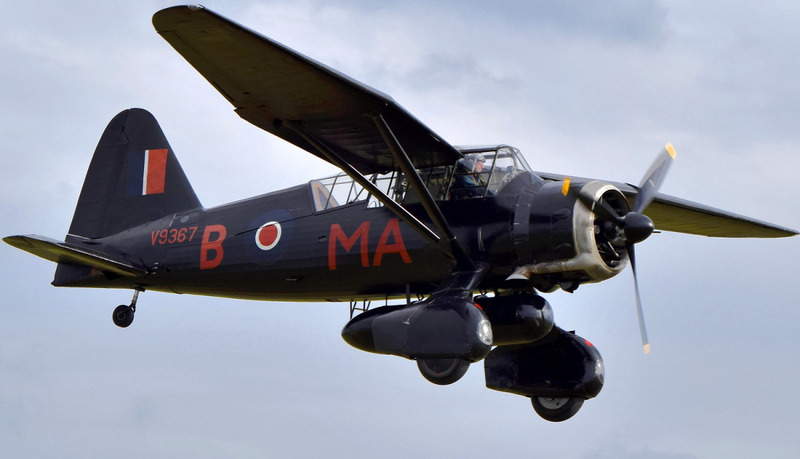 The Lysander Mk.III was originally used as a target tug, from 1942, by the Royal Canadian Air Force. It was then sold to a Canadian collector before moving to the 'Strathallan Collection' in Scotland where it was restored to flying condition by late 1979. 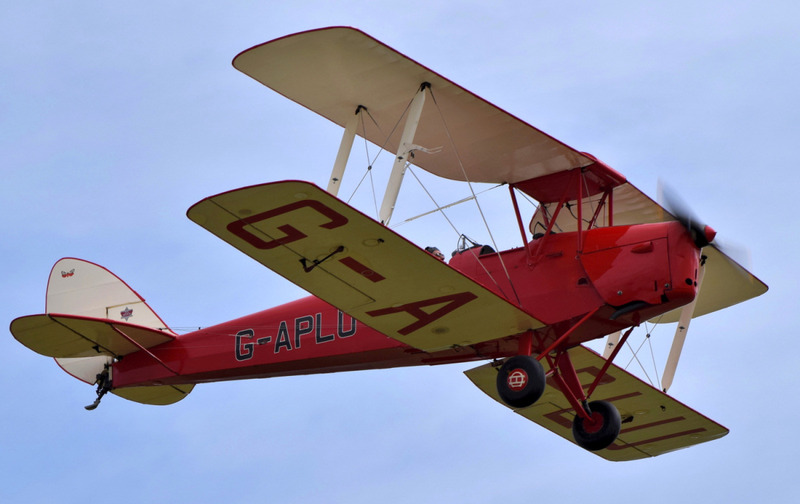 It was grounded in 1986 and went to Duxford in 1997 for further restoration and later joined the Shuttleworth Collection in 1998. 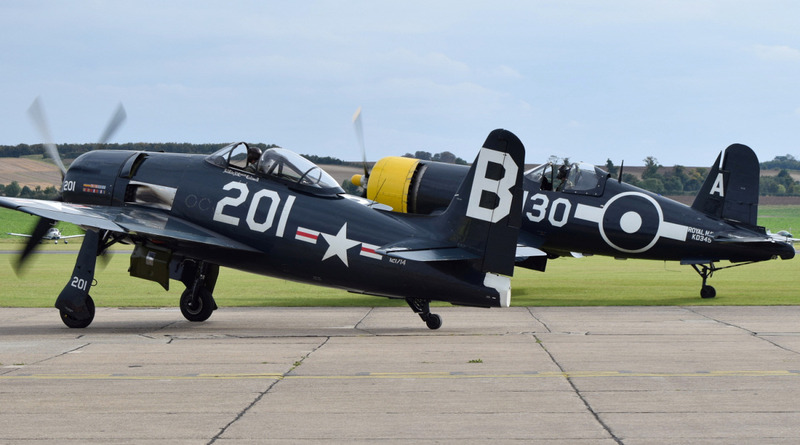 The 'Navy Fighters' theme included 'The Fighter Collection's' Grumman F8F-2P Bearcat (BuNo 121714), Goodyear FG-1D Corsair (BuNo 88297), and 'Air Leasing's' Hawker Fury FB11 (SR661). 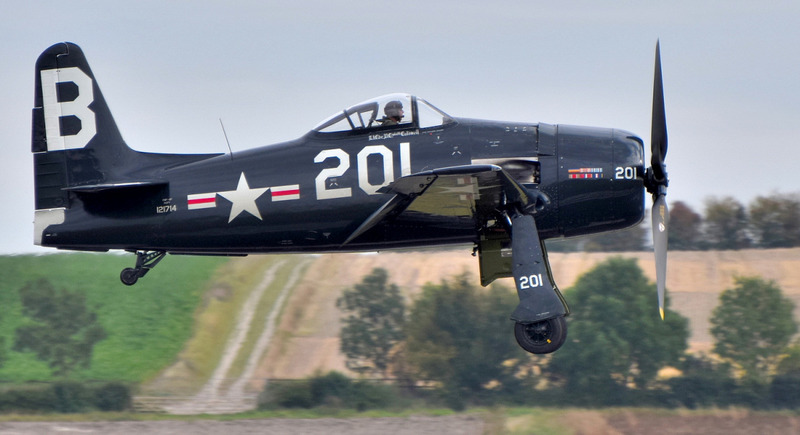 The Grumman Bearcat was an American single-engine carrier-based fighter aircraft introduced in late World War II and this aircraft is the longest serving aircraft of 'The Fighter Collection' after it was acquired in 1981. 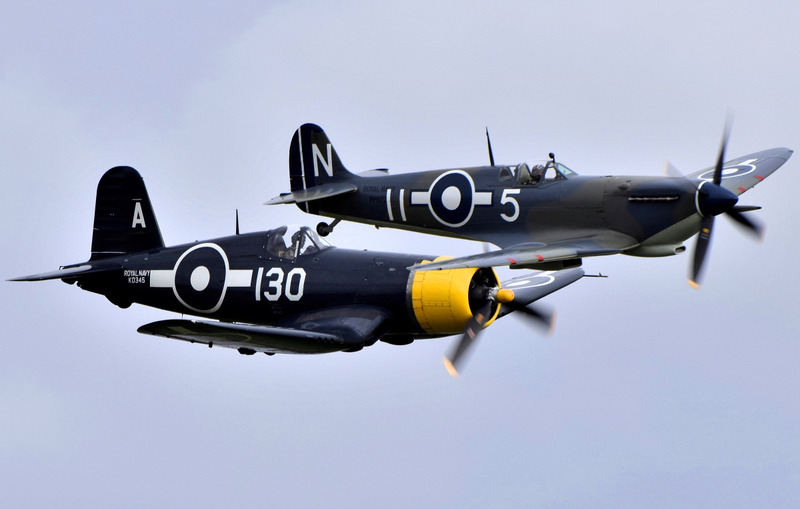 The FG-1D Corsair was also an American single-engine carrier-based fighter aircraft that saw service at the end of World War II and the Korean War. 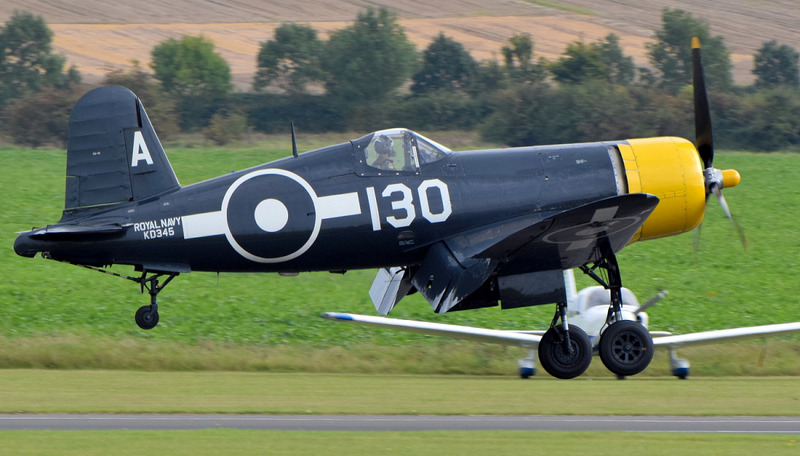 This Corsair is painted in the colours of a British Fleet Air Arm machine, KD345 of 1850 Squadron during December 1945, when they were embarked on HMS Vengeance of the British Pacific Fleet. 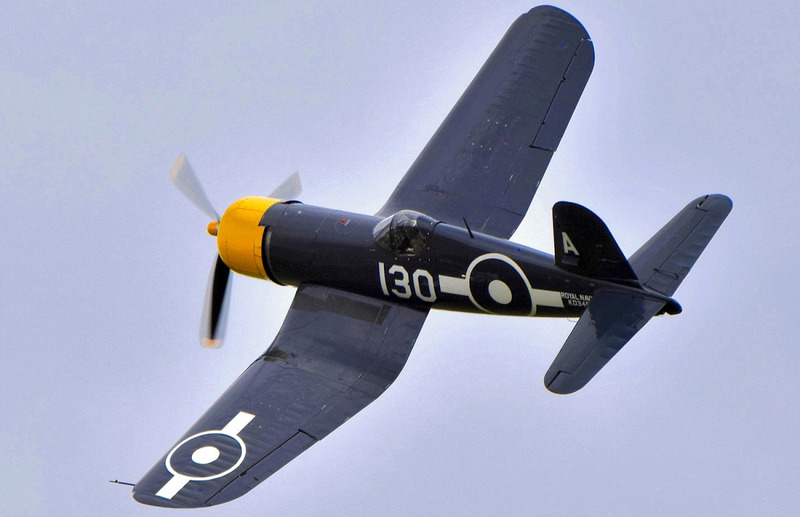 The Hawker Sea Fury was the last propeller-driven fighter to serve with the Royal Navy, and one of the fastest production single piston-engined aircraft ever built. 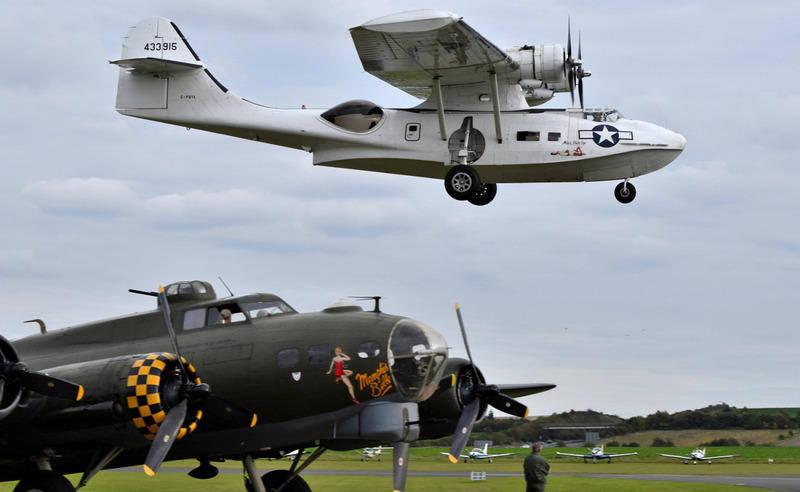 Continuing with the Navy theme, we saw 'Plane Sailing's' Consolidated PBY-5A Catalina (G-PBYA, 433915) and the Grumman FM2 Wildcat (BuNo 86711). This Catalina was ordered for the Royal Canadian Air Force as a Canso A amphibian which is equivalent to the US Navy PBY-5A. It originally operated from Western Canada looking for Japanese submarines in the Pacific Ocean. 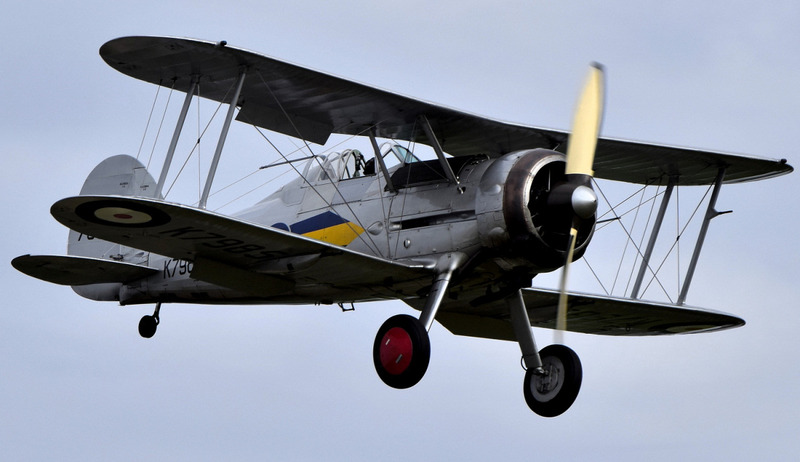 The Grumman Wildcat was an American carrier-based fighter aircraft that served with the United States Navy and the British Royal Navy, as the Martlet, in 1940. 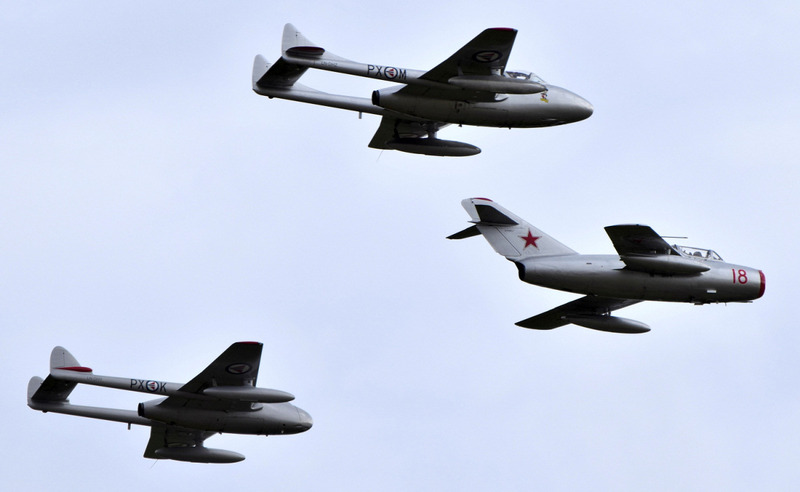 The 'Norwegian Air Force Historical Squadron' (NAFHS) displayed their Mikoyan-Gurevich MiG-15UTI, de Havilland Vampire T.55 and de Havilland Vampire FB.52. 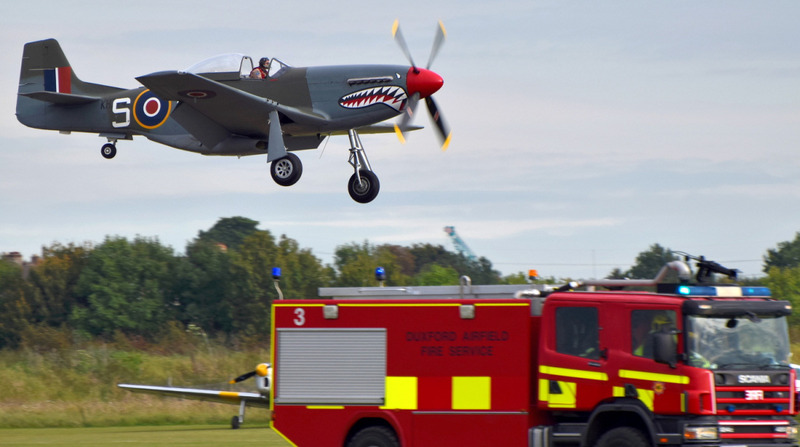 The NAFHS are a non-profit organisation who are dedicated to displaying their aircraft at as many public airshows in Norway and abroad that they can. 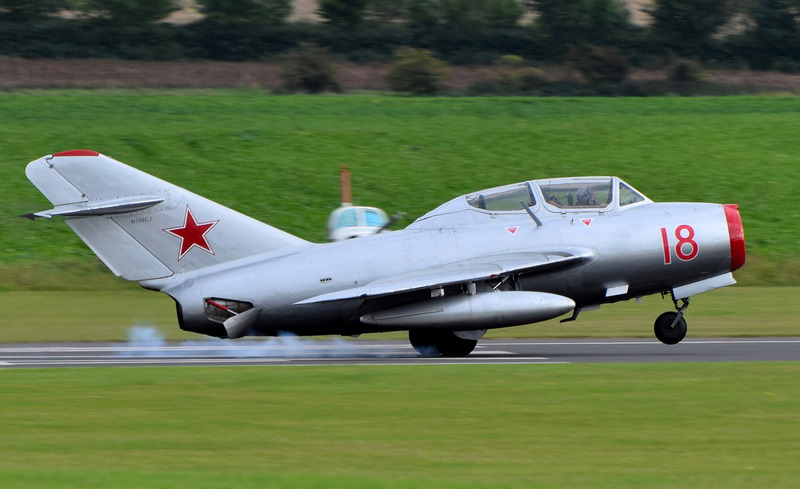 The MiG-15 was a Soviet Jet Fighter, which was introduced in 1949, with over 12,000 aircraft manufactured. The MiG-15 UTI variant was a two-seat dual-control jet trainer and this aircraft was painted and marked as 'RED 18' to represent Russian-Soviet pilot and cosmonaut Yuri Gagarin's MiG-15. 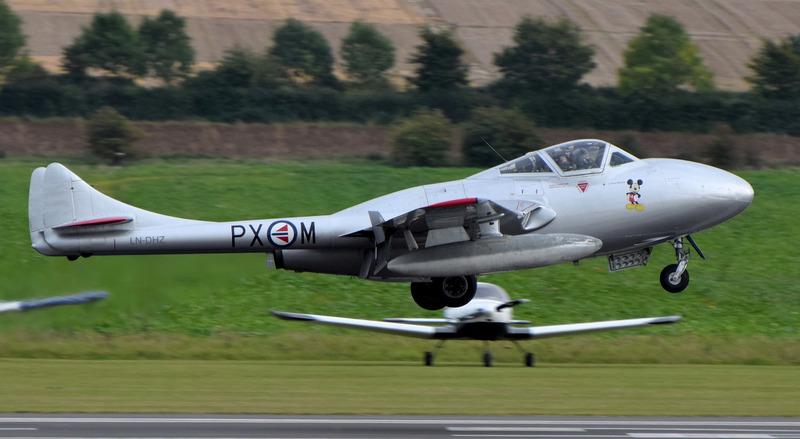 The de Havilland Vampire was a British jet fighter, introduced in 1946, which had a single turbojet engine and twin-boom design. The Vampire FB.52 was an export variation of the FB.6 fighter-bomber and the Vampire T.55 was an export version of the DH.115 trainer. 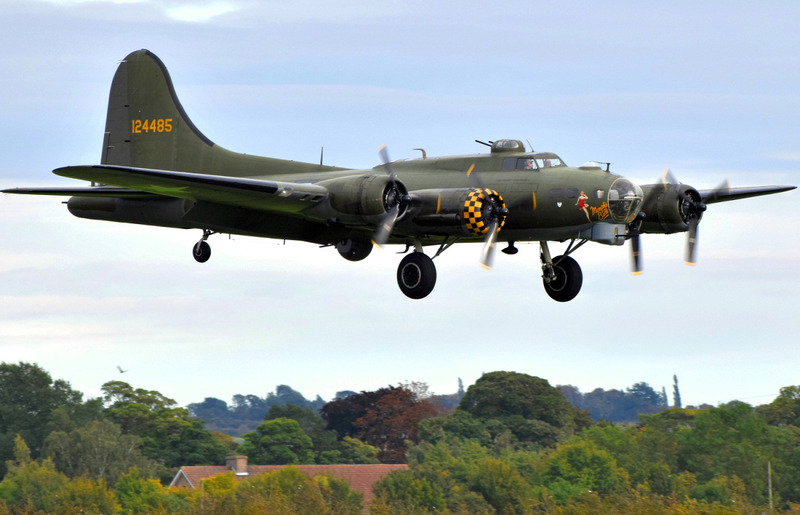 Representing 'Heavy Formation and Top Cover' was 'B-17 Preservation's' Boeing B-17G Flying Fortress (Sally B), in formation with two Douglas C-47 Skytrain's (Aces High Ltd & Dakota Heritage Inc). 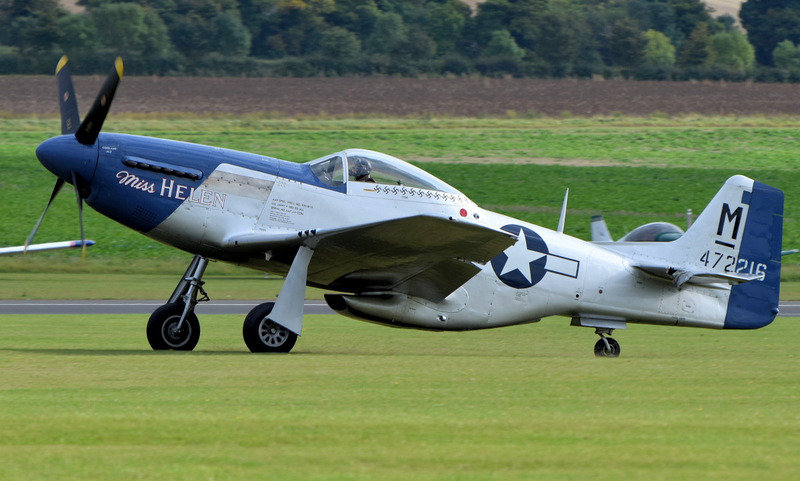 Top cover was provided by two P-51D Mustangs:- North American P-51D Mustang (G-SHWN, 'The Shark', Norwegian Spitfire Foundation) and North American P-51D Mustang (G-BIXL, 'Miss Helen', Boultbee). 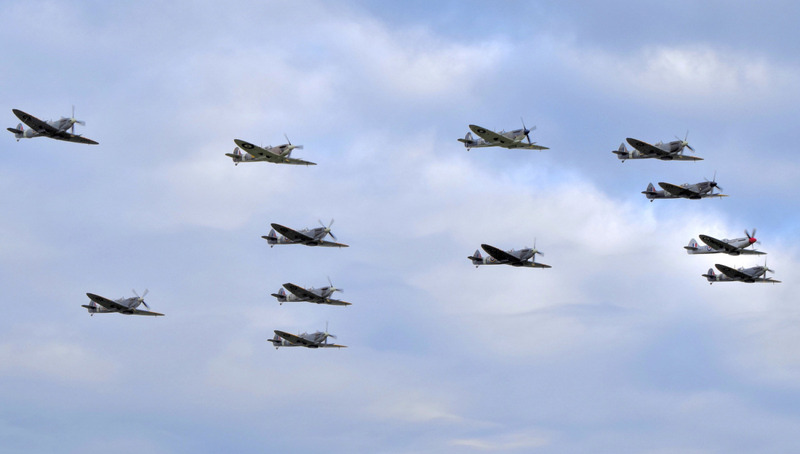 One of the highlights of the day was the 'Spitfire Formation' which involved twelve Spitfires, as well as another Spitfire acting as the joker, which entertains the crowd, giving the Spitfires time to get into formation. 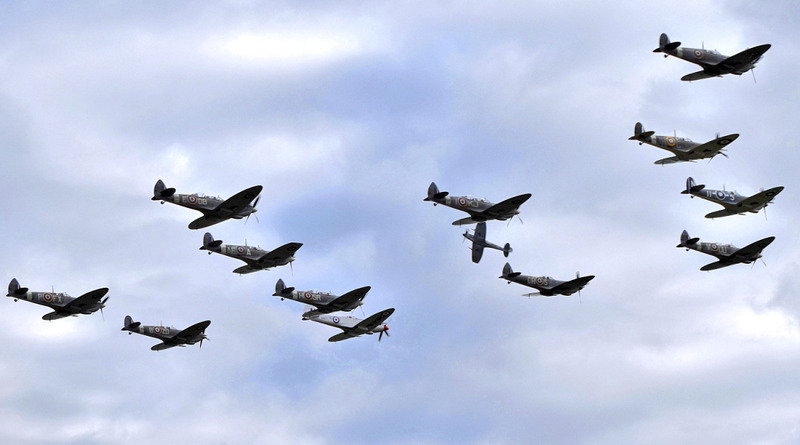 The twelve Spitfires in formation were Spitfire TR.9 (ML407, Air Leasing), Spitfire XVIe (TD248, Richard Lake), Seafire III (PP972, Air Leasing), Spitfire XVIIIe (SM845, Richard Lake), Spitfire IXb (MH434, Old Flying Machine Company), Spitfire TR.9 (PV202, Aircraft Restoration Company), Spitfire Vb (BM597, Historic Aircraft Collection), Spitfire TR.9 (SM520, Boultbee), Spitfire Vb (EP120, The Fighter Collection), Spitfire IXe (TD314, Aero Legends), Spitfire IX (RR232, Boultbee), and Spitfire TR.9 (NH341, Aero Legends). 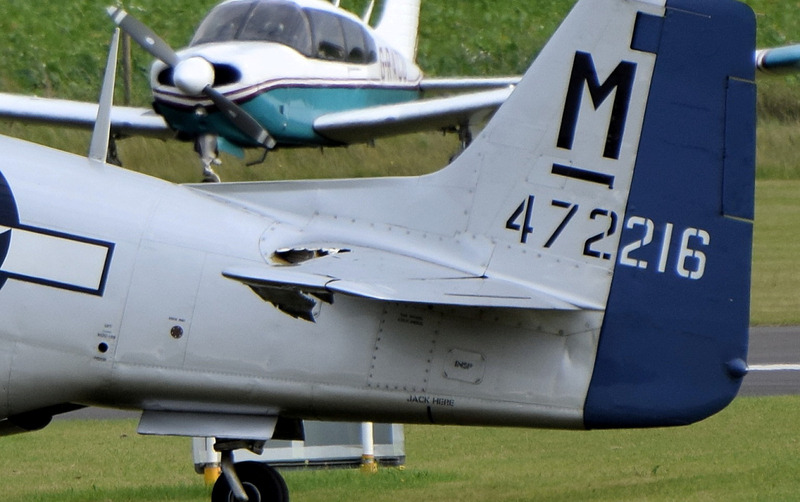 The joker was Spitfire XIVe (MV293 (marked as MV268), Air Leasing). 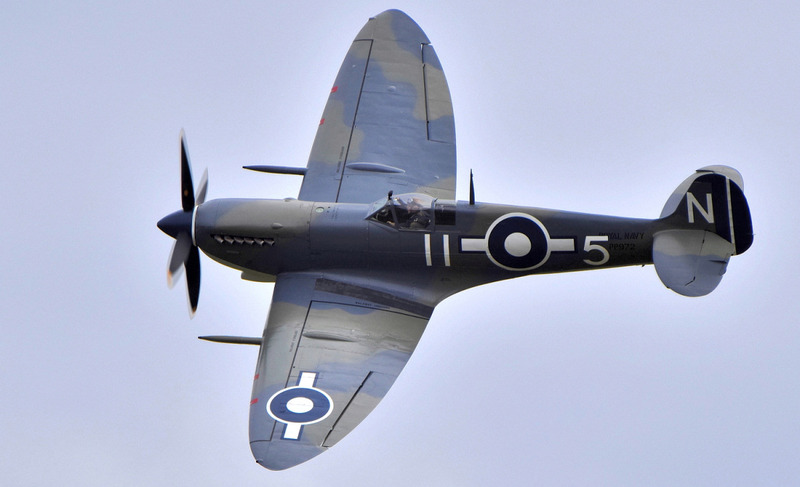 The Supermarine Spitfire is famous for its part in the 'Battle of Britain', helping to repel the German fighters and bombers, and halt the invasion of Britain. 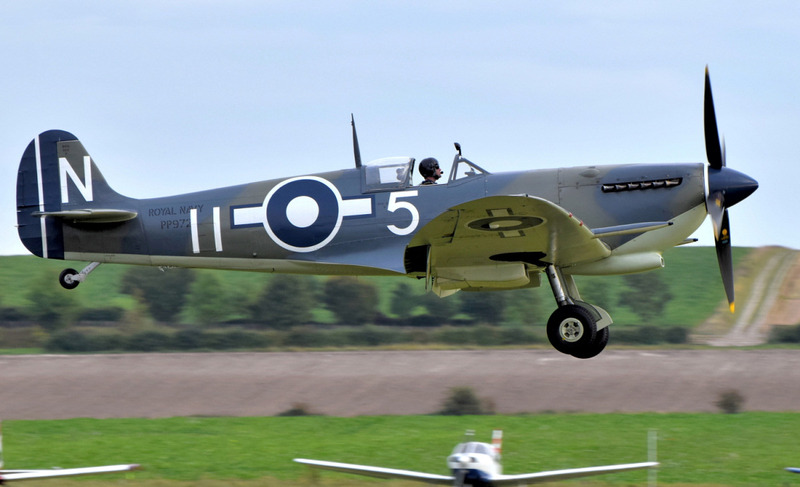 The distinctive shape of the Spitfire with its elliptical wings, designed for high-speed, was the design of R. J. Mitchell, chief designer at 'Supermarine Aviation Works'. Coupled with the powerful Rolls Royce Merlin engine it proved to be a formidable fighter. 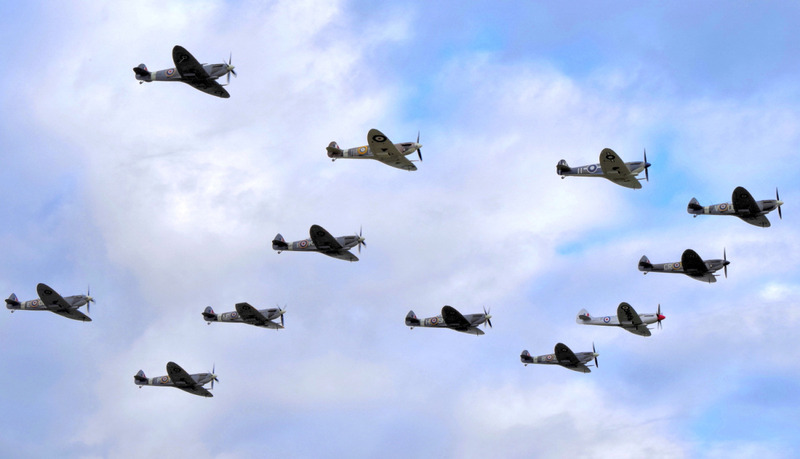 The Spitfire's frame was strong and adaptable enough to be upgraded throughout the War with more powerful engines and capabilities. 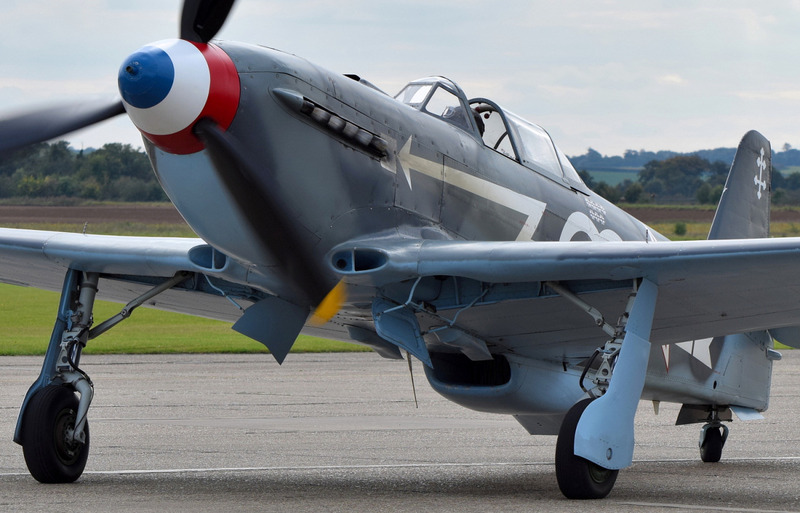 The Spitfire saw action in the European, Mediterranean, Pacific, and South-East Asian theatres and served in several roles, including interceptor, photo-reconnaissance, fighter-bomber and trainer, and it continued to serve in these roles until the 1950s. 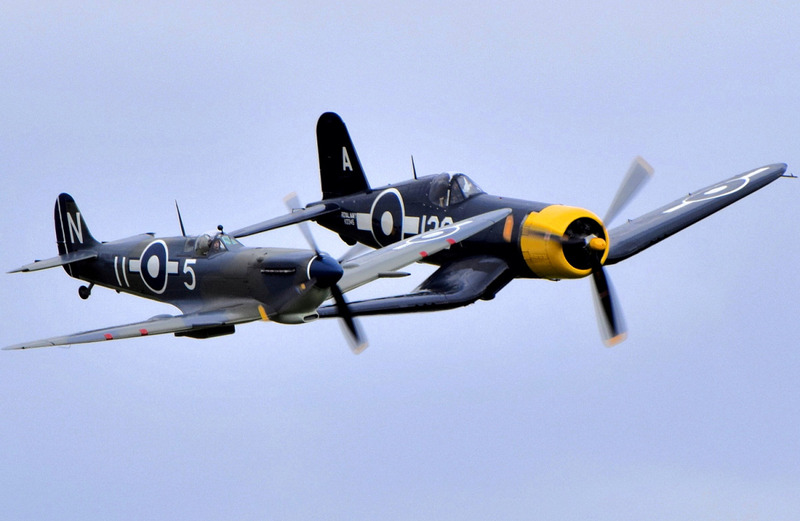 The Seafire served in the Fleet Air Arm from 1942 to the mid-1950s. 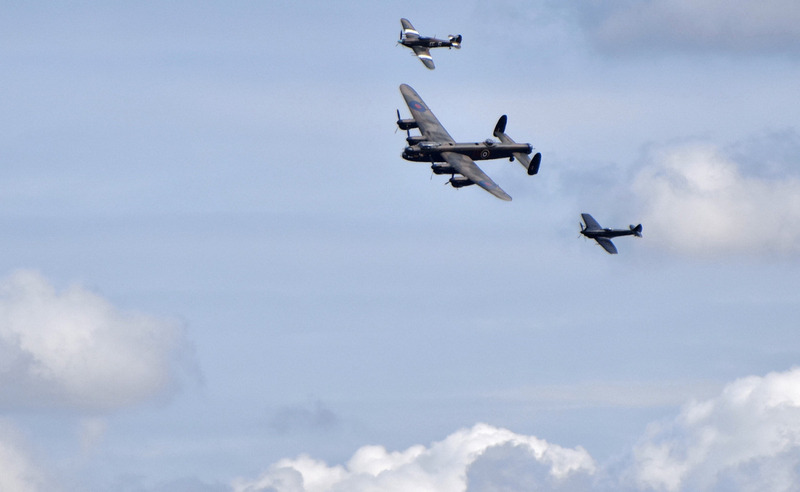 To close the air display we had another formation flypast which included aircraft that had contributed to the 'Battle of Britain'. 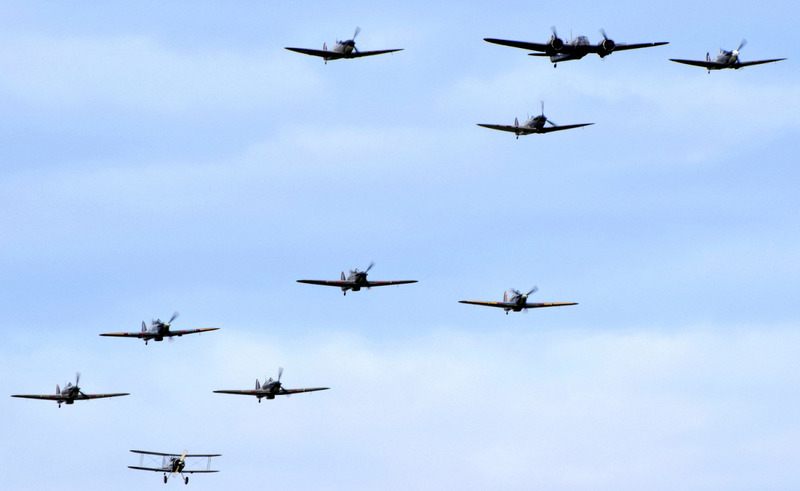 This consisted of a mix of five Hurricanes, three Mk.I Spitfires, a Bristol Blenheim and a Gloster Gladiator. 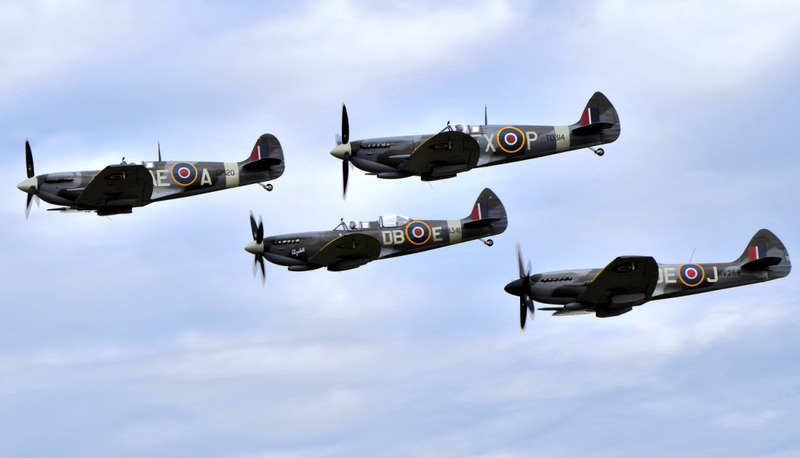 The three Spitfires were Spitfire Ia (N3200, IWM), Spitfire Ia (AR213, Comanche Fighters) and Spitfire Ia (X4650, Comanche Fighters). 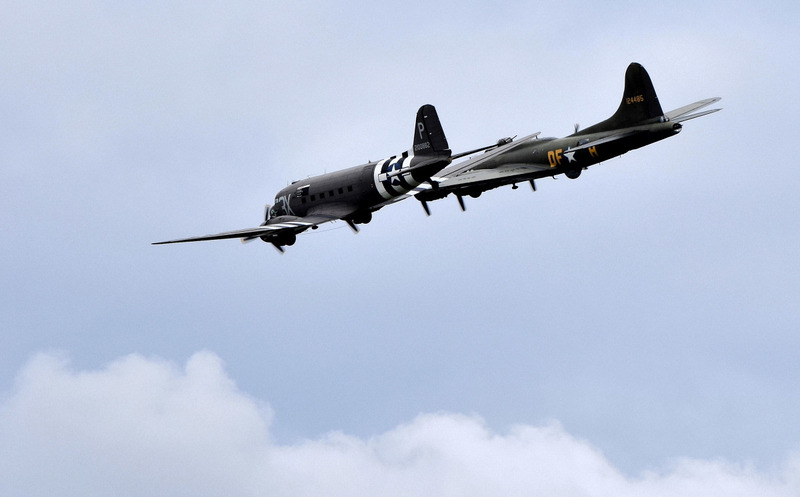 Duxford airshows really are unique in the UK, for putting up so many warbirds in the air together, which is an awesome spectacle. 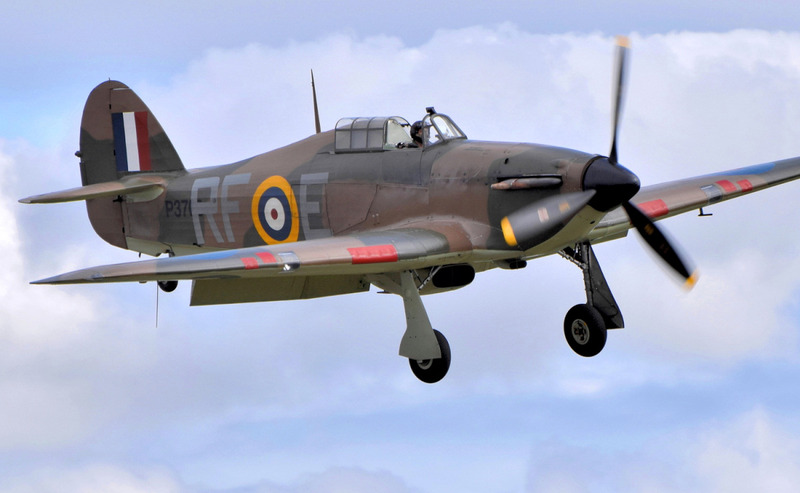 Thanks to the 'Imperial War Museum Duxford' for putting on another superb airshow with so many Hurricanes and Spitfires in the air display.